Mother Nature showed off her splendor. This remarkable experience was shared by the following individuals: Kate Allen, Peggy Carl, Sheila and Robert Anderson, Kerri and Jim Stephenson, Pat and Don Carlson, Janet and Emery Baca, Joyce Davis, Merilyn Evans, Kimberly Jackson, Chris Johnson, Mary Kain, Beverly Gordon, Mary Hulett and Jorgen Hog, Diana Kunde, Julie Sieh, Linda Malsbary, Nancy Lappin, Linda Love, Vicki Mitchell, Marilyn Young, and Lindy and Bruce Wilks. Cork fly holders by Janet and Emery Baca. We would like to thank Janet and Emery Baca for the great cork fly holders that were presented to all the members and guests at the Friday night Mullet Mixer and to everyone for all the great food and delicious desserts. We were thrilled to have Eddie Brister from the Beavers Bend fly shop in the park and one of his Lake City, Colorado guides, Peter Breeden, who guides at Broken Bow in the winter as our featured speakers at our Mullet Mixer on Friday night. Eddie’s presentation detailed the history of trout fishing in the Lower Mountain Fork and his vision for the future. Peter talked about where to fish and the different types of flies to use. Eddie was very generous and donated the money that Pat and Don Carlson paid for a guided fly fishing trip on Friday back to the club. He also gave us a $50 gift certificate as a door prize with the lucky winner being Vicki Mitchell. Many thanks to Eddie and the Beavers Bend fly shop for their generous and continued support of our club. Stop in and say hi to Eddie and his wife Roberta who always has a smile on her face if you’re in the area. Chris Johnson demonstrates a knot. We were again privileged to have Chris Johnson from Living Waters Fly Fishing in Round Rock join us for a weekend of education and coaching and even some great story-telling. Chris taught a clinic at Evening Hole on Saturday morning that was very well attended and covered basic fishing strategies, how to tie on the nymph dropper rig and proper presentation of the fly. Chris guided the rest of the day Saturday and again on Sunday and members were able to sign up for a two-hour block of instruction with two people at a time. Many fish were caught by all. Chris also taught a two-hour clinic on Sunday morning attended by Janet and Emery Baca. Chris covered the techniques of fishing pocket water and how to set up your line to work the areas that go mostly un-fished because of the fast water that surrounds the pockets. 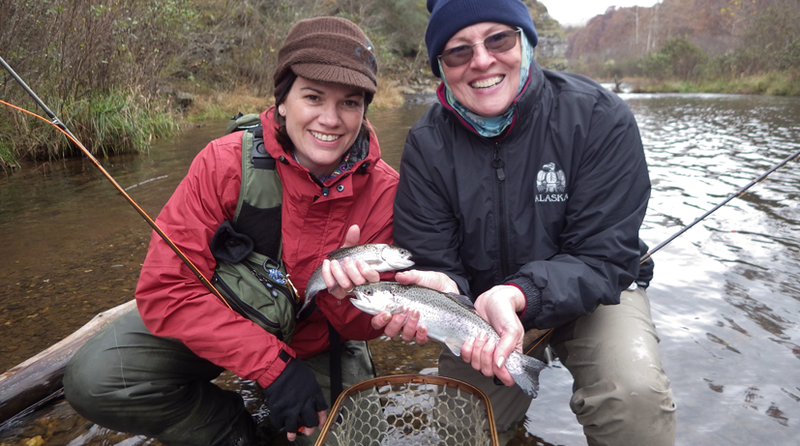 After 30 minutes of instruction on reading the water, riggings, and technique, Janet and Emery started fishing and caught several wild rainbow and stocked rainbows on the upper spillway. Braving the cold weather and brief sleet showers off and on while out with Chris, they gained a lot more confidence for future fishing in these types of pocket water areas with success. Following a delicious fried chicken, beans, and cole slaw meal from the Blue Rooster on Saturday night, including blackberry and pecan cobbler, our business meeting concluded with several important results. We also had a very successful silent auction with proceeds of over $1000. Another highlight of the Sat. night dinner at Broken Bow was the drawing of the winning ticket for the beautiful handmade fish-themed quilt. Following the drum roll, the ticket was read “KAREN GEBHARDT.” Congratulations Karen. We are all envious. Karen was not able to attend the BB outing due to CFR commitments. Our headquarters for this outing were again at Secluded Acres. We enjoyed the use of the spacious meeting room free on both Friday and Saturday. Again Tom Verace came to our rescue by purchasing more tables and having them delivered to the group early on Friday. Every year Tom goes above and beyond for TWFF and we would like to thank him again for his generosity. Thank you to the great members and guests of TWFF for making this another memorable outing. And since this was the last outing of the 2014 year, we would like to express our sincere appreciation to Pat Carlson and her husband Don for an outstanding two years of leadership and their dedicated and unwavering commitment to our club. They truly went above and beyond in their service to TWFF.